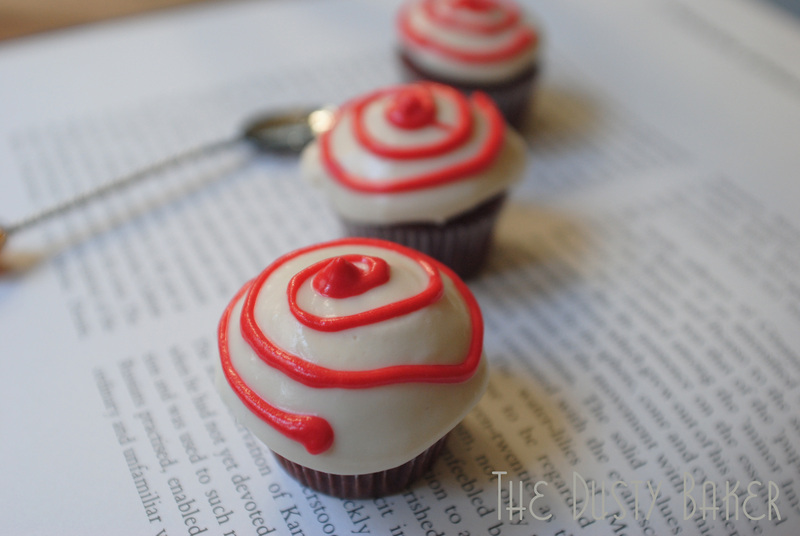 The Little Red Velvet Riding Hood Cupcakes – Gluten and Dairy free! These cupcakes are amazing. I just wanted to start with that. You can’t tell that they’re gluten AND dairy free. My roommate’s eyes lit up when she took her first bite, and after her third she proclaimed it her favorite of my creations. Even I am wowed by how good this cupcake is. 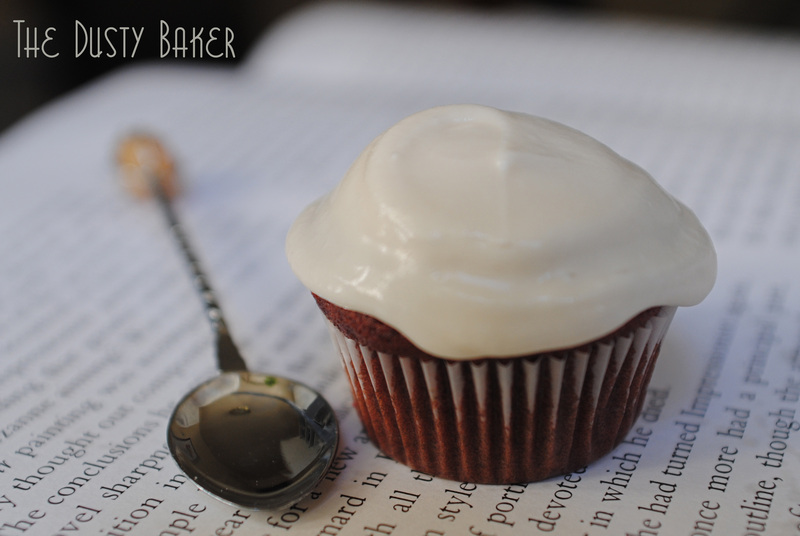 I can confidently say this is the best gluten-free red velvet cupcake recipe. 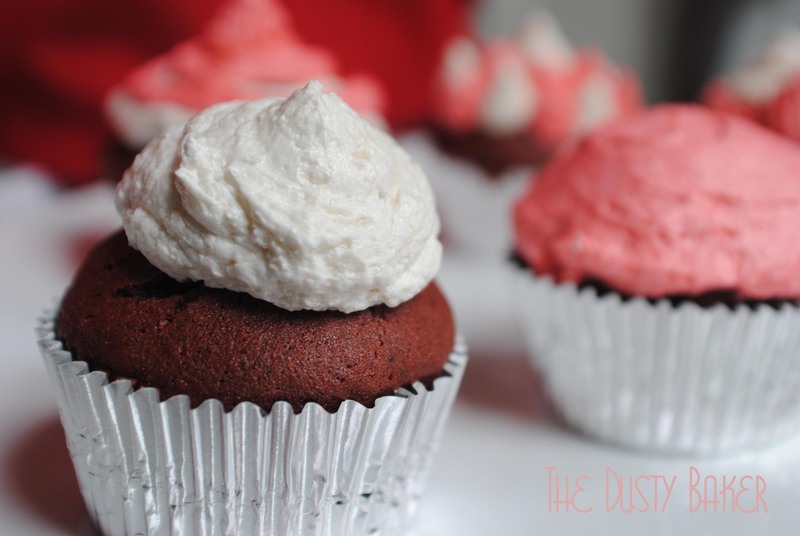 AND the best dairy-free red velvet cupcake recipe. There. I said it. But I should know. I’ve eaten about 12 of these little guys. Including two this morning, before breakfast. Brainstorming first came when I online-met Kelli of Ingested Read. I love her new blog, and her recipes are created for a specific book she’s pouring over. I’m a big fan of this idea, and this blog. So she opened up her site for guest-posts with Intercaketuality. Brilliant. I’m sending her a big high five across the pond. I knew I wanted to make some sort of red-velvet cake. In my gluten-free food crawl with a few friends I learned that the three bakeries in the city that boast gluten-free offerings disappointed our taste buds in the red-velvet department. Either too dry or too moist, none contained that classic cocoa flavor. A few months ago my cousin Daniella played Little Red Riding Hood in her high school production of Into the Woods and, as I predicted, was stellar, stealing the show. In this musical version Little Red has a slight obsession with baked goods, eating all the bread and sweets she is supposed to take through the woods to granny. Daniella herself is very allergic to dairy, so over the years we’ve commiserated at the dessert table as treats were passed around. But a few challenges arose when making this both gluten and dairy free. First, how to replicate cake flour? According to my interweb research, cake flour is distinctive because (a) it is very finely milled, (b) it contains a low amount of protein which develops gluten and (c) it has a higher amount of starch as a result. So, how to make a gluten-free version of cake flour, which obviously lacks gluten to begin with? Several sites including Gluten-Free Bay, WikiHow and Gluten Free Naturally Blog use the same ingredients in the same proportions. I don’t really use potato starch, as it’s a nightshade and not good for people with arthritis and digestive issues, so instead I used arrowroot and crossed my fingers. I also used 2 cups of brown rice flour and 1 of white rice flour, and sifted twice. This worked wonderfully in the cake. I’ll have it on hand from now on. I then had to replace buttermilk with a non-dairy ingredient. Normally I’d just use almond or soy milk, but as the consistency of buttermilk is a bit thicker and tangy, I had to improvise. So I used tofutti sour cream and diluted it with unsweetened almond milk, then threw in a tablespoon of white vinegar. It worked! For a frosting I whipped up a tofutti / Earth Balance spread from Mama Sophia’s Soul Kitchen. It’s a very tasty recipe, tangy and sweet without being overpowering nor tasting like soy. But as you can see in this picture, it’s more like a pretty, thick glaze. It has a gorgeous sheen, but even when refrigerated overnight it was far too loose for piping. So I glazed the minis with these and then found an incredibly light and fluffy vegan frosting that I whopped on the big guys. Notes: Make sure you have all your ingredients are room temperature or slightly warm. Make sure your oven is properly heated. Don’t over-mix the dough when you’re stirring in the last batch of dry ingredients. Add Tofutti cream cheese to a liquid measuring cup and fill to just shy of one cup with almond or soy milk. Whisk thoroughly with a fork until smooth. Heat in microwave until warm but not hot. Add 1 Tbsp white vinegar and stir in. In the bowl of a standing mixer, mix sugar, agave and oil thoroughly on medium speed until thoroughly combined. These can be kept in a refrigerator for 3 days in an airtight container. Bring them down to room temperature before serving.